More than 100 UK Atomic Energy Authority staff have lost their jobs at Dounreay in Caithness. An administrative reshuffle has led to 35 workers taking up early leaving terms, or retirement, while 70 have not been given posts in the new set-up. 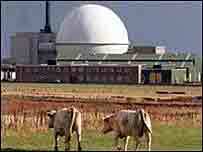 Dounreay deputy director Simon Middlemas said the 70 have not been made redundant. He said they were being offered the chance to retrain or re-skill to take up other vacancies. Mr Middlemas said unions have been kept up to date with the current exercise. He said it had been a very unsettling time for the decommissioned fast reactor plant's 1,200 staff. Staff involved cover a range of grades, but it is believed many are at a managerial level. Meanwhile, there are now 11 managers at the site seconded from the UKAEA's new joint venture companies - British engineering giant Amec and Colorado-based CH2MHill. Mr Middlemas said the personnel have been brought in to beef up UKAEA's bid to win the new site management contract. He expected the number of staff seconded from the two firms to average about 15.